If your system memory is faulty, it can cause all manner of weird and wonderful problems, many of which you wouldn’t relate to system RAM being the culprit. Another part of your system that could have its own memory is the graphics card, and of course that could also fail or become faulty as well. While a problem with system RAM can be difficult to pin down because so many issues it causes can seem unrelated, video memory should be easier to identify because the issues will be related to the displaying of images on the screen. This can manifest itself in a few ways, such as getting a blue screen of death or a restart while playing games or using graphically intensive software. Other issues could be graphical glitches or artifacts during gaming, these issues are more likely to occur while your graphics card is working as hard as possible. If you suspect there is a problem with your video card’s memory it would be a good idea to try and test it to help determine if you need to replace or return your card. Here are 5 tools that can help you test the memory of your video card. 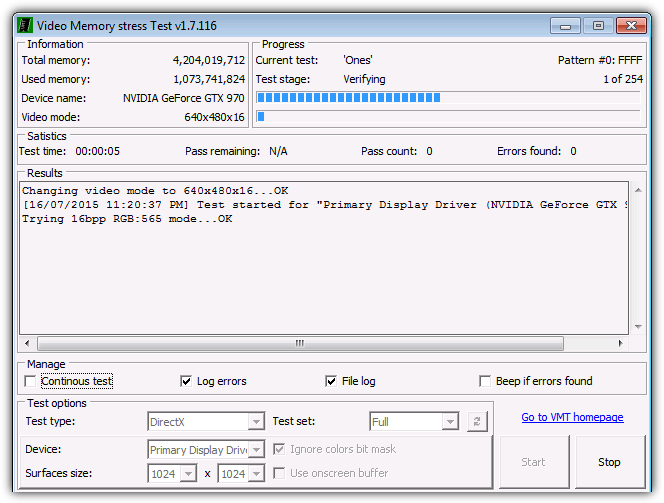 Video Memory stress Test is from back in 2008 and by Misha Cherkes, the same guy behind the useful Check Flash USB drive testing tool. This tool allows you to test your video card RAM using one of three different test types, DirectX, CUDA and OpenGL. It looks similar to the system memory tester Memtest86+ and works in the same way running a number of predefined patterns to test the memory as thoroughly as possible. There’s also an offline version that can be booted using CD or floppy. Three testing sets are present which you can run, they are Full, Express 15% or Small which is good for quickly checking of overall memory integrity. There’s a few issues with Video Memory Stress Test, most notably is the problems scanning all the memory on newer cards with 2GB or more of dedicated memory, it’s also mentioned online that the CD/floppy version can on read 512MB of video card memory. It may also fail when trying run tests in 24 or 32 bit color display modes, run the vmt.loader.bat in the folder to configure your own set of tests. These two utilities have been grouped together because they have subtle differences but are essentially the same. MemtestG80 will test nVidia graphics cards that are CUDA enabled, CUDA has been around since 2007 and classic old video cards such as the GeForce 9600GT, 8800GT and 8800GTX should be supported up to current day cards. 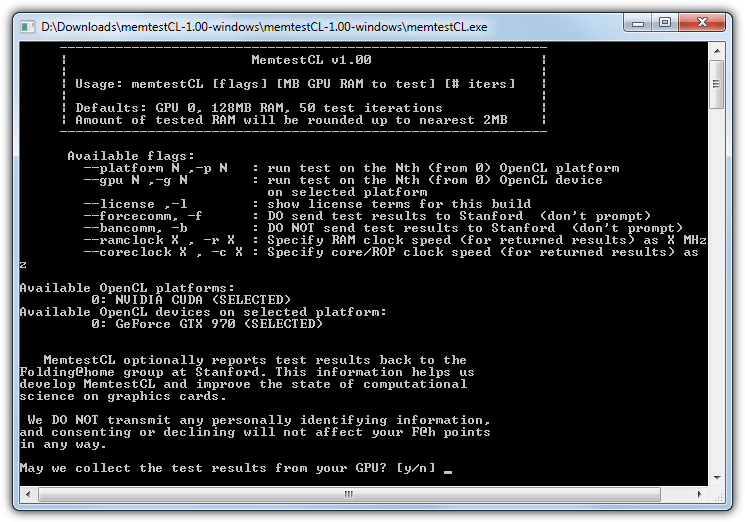 MemtestCL is slightly different and supports OpenCL based cards, this covers a different range which includes AMD/ATI 4000 and 5000 series or above, and nVidia 8000/9000 series or newer. Both versions of Memtest are command line based so to configure them from the defaults you will need to add arguments in Command Prompt. Simply running the executable will perform a default test which is to scan the first 128MB on the first card in the system, and run 50 passes. If you have more than one graphics card in the system, make use of the -gpu option. By default these tools will ask to send statistical data about the tests to the Folding@Home group at Stanford University, you can disable this option through the command line or press n to answer no. The tests are a mixture of custom patterns and some based on Memtest86 test patterns. An open source version of MemtestCL available at Github that excludes the data logging options. While this next method doesn’t physically scan the memory for errors like the previous tools, it does run a series of burn in type tests that will stress the video memory and likely show any errors that the graphic card’s RAM produces. 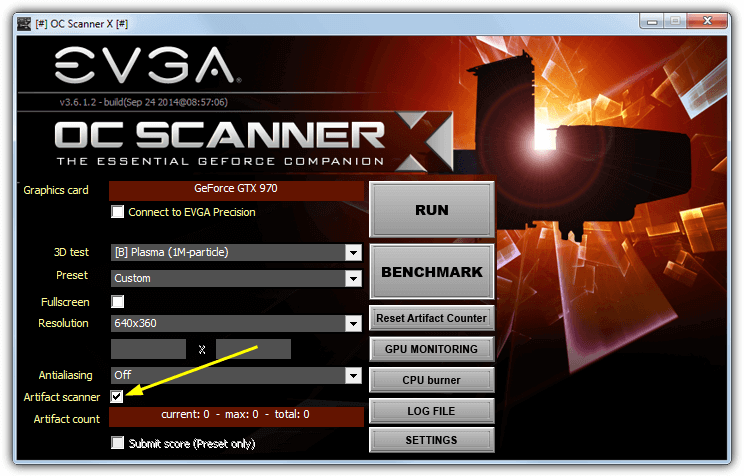 OC Scanner X is by the video card manufacturer EVGA and will work on any graphics card, not just their own. The downside is you need to have a free account at EVGA.com to download the tool, although a shared login service like BugMeNot has a few pre registered logins which might help. After downloading and installing OC Scanner X, run the program and select the 3D test and resolution you want and then make sure to check the “Artifact Scanner” box. Run the test for several minutes and any artifacts the program detects during the testing will be counted. Constant artifact counts over more than one run of the tests could mean issues with the graphic card’s memory. Another burn in tool that has a video card memory error checking ability is an older version of OCCT, for some reason this function seems to not be available in newer versions or has been merged in with another test. It runs a series of Memtest like scans and the user sets the number of passes before starting the scan. After running the program go to the GPU: MEMTEST tab and select the number of passes although the default of 10 should be quite thorough, dropping it to 5 would be enough for basic testing. Then press the On button. 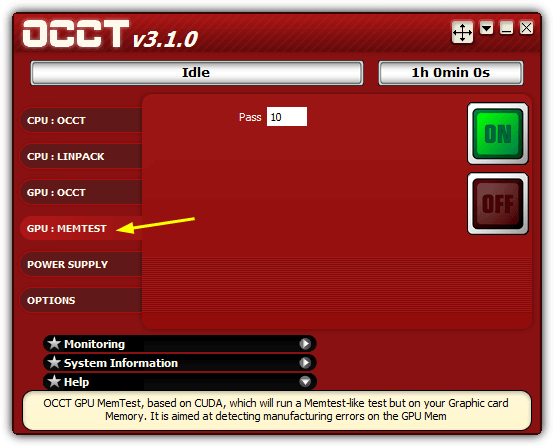 Note the memtest function of OCCT is based on nVidia CUDA and therefore will only work on nVidia graphic cards . At least memory stress test showed me what I had in suspicion while all GPU experts and geeks said there is no problem, out of nowhere my GTX 980Ti has lost 4GB capacity, yet all I was doing was playing games only on 1080p mid high settings and kept GPU at 70C, while here where I live it gets like 30C hot on daily basis. Very nice, but once one has identified any defective memory; is there a way of disabling it?? Thanks once again for some very helpful information and for also providing the link’s too. Cheer’s Raymond. This seems like a handy tool. Hmmm….seems a test like the Prime95 torture test for overclockers. Worth a try. Now if only We could get a “fan stopped turning” warning. heh.. Thanks, Raymond this tool will come in handy. Thanks for the share Raymond. One useful tool for my friend, going to suggest him ;).